A major thesis advanced to explain Cuba’s transition into a Marxist-Leninist state centers on that country’s presumed economic backwardness and immobilism. In the “received wisdom” pervading academic circles and the media, prerevolutionary Cuba is perceived as a kind of Hispanic-American Haiti. The backwardness-stagnation thesis is often supported by a corollary: the alleged exploitative grip by which U.S. investors held the Cuban economy. It is not surprising that distortions and inaccuracies regarding Cuba’s prerevolutionary economic condition should appear in neo-Marxist publications outside of Cuba nor that Cuban authorities deliberately falsify statistics on their country’s social condition— before and since the revolution. What is surprising, as well as disturbing, is that these distortions have unwittingly been accepted by reputable economists and political scientists, members of Congress, and as well as by editors and journalists of the Western press. In an important monograph published five years after Batista’s fall, Dudley Seers, the volume’s editor, describes prerevolutionary Cuba as “a somewhat backward tropical country.”1 Benjamin Higgins, whose work in economic development is generally highly regarded for its theoretical rigor and thorough documentation, appears to have partially accepted the “backwardness thesis.” Thus, in a chapter entitled, “Cuba: The Anatomy of Revolution,” he writes that Cuba’s relatively high per capita income “does not properly indicate the extent of poverty, ignorance, and ill health that prevailed in Cuba in 1958.”2 His statement that Cuba’s illiteracy “was about equal to the Latin American average, about 40 percent” is contradicted by United Nations and Cuban statistics which show the island’s illiteracy rate to be only about half that figure. Michael P. Todaro’s 1997 edition of Economic Development includes a brief “Case Study: The Economy of Cuba” prepared for the author by Professor Frank Thompson which claims that American-based firms dominated every major sector of the Cuban economy, including sugar, until the revolution. Describing Cuba in the 1950s, Thompson writes: “Regulations modeled on southern U.S. Jim Crow laws were imposed, and Havana, the Cuban capital, became known as ‘the Bordelo’ for U.S. vacationers seeking pleasures forbidden at home.”4 Writing glowingly of the transformation in health and education systems under the Castro regime, the author is silent on Cuban health and literacy indicators on the eve of the revolution. The purpose of this paper is to reassess Cuba’s economic condition on the eve of the 1959 revolution. Four decades following Fidel Castro’s rise to power, this assessment can now be considered in the perspective of the “New Thinking” in Latin America that came in the aftermath of the region’s 1982 debt crisis. The first section previews Cuba’s sugar-dependent “export economy.” The second section analyzes the country’s resource endowment and living standard, including social indicators, on the eve of the revolution. The third section focuses on Cuba’s successful diversification drive during the 1950s.13 The fourth section considers the changing sectoral profile and economic impact of U.S. direct investment in the host country from 1946 to 1959. The paper closes with a summary and some observations on the “backwardness-stagnation-exploitation” allegations. In organization and structure, Cuba, until the latter 1950s, typified what economists have come to call an “export economy.”14 Such an economy exhibits the following properties: a high ratio of export production to total output in the cash sector of the economy; a concentrated export structure; substantial inflow of long-term capital, including the presence of foreign-owned enterprises; and a high marginal propensity to import. Commonly, in such an economy, government revenues are tied closely to the oscillations of export income. The export sector constitutes the dynamic, autonomous variable that powers the nation’s development; it is also the short-run disturber. The sheer weight of exports in relation to total economic activity dictates that the external market rather than private investment or government expenditure exercise predominant influence on aggregate demand. Because of its specialized structure, the export economy is heavily dependent on foreign sources for many kinds of consumer and capital goods. In the immediate postwar period, Cuba’s sugar “sector”—including cane growing and the industrial and commercial income from the milling and marketing of raw sugar—contributed directly about onethird of the national income and accounted for 90 percent of Cuba’s external receipts from exports and thereby constituted the great independent variable,” the “master beam,” of the island’s economy. In 1958, on the eve of the Cuban Revolution, the United States was purchasing two-thirds of the island’s exports and was supplying 70 percent of its imports. Next to Brazil, Cuba was the most important Latin American source of agricultural imports of the United States. During the five-year period, 1954- 1958, the United States purchased three-fourths of Cuba’s tobacco and 60 percent of its sugar. Raw Cuban sugar was sold to the U.S. under a quota system at prices that in most years were substantially above the world price.19 Both the quota and the more stable U.S. premium price helped to curb the annual fluctuations of Cuban sugar sales abroad. Prior to 1959, the framework of Cuba’s commercial policy was the General Agreement on Tariffs and Trade (GATT). Negotiated preferences under this agreement gave the United States and Cuba lower tariff rates on most products imported from each other than were obtained on imports from other countries. Some 30 percent of Cuba’s trade turnover in 1958 was carried on with non-Communist nations other than the United States, while only 3 percent of the island’s exports went to the Soviet bloc. The Communist nations in that year were an insignificant source of imports for Cuba. Next to the United States, Western Europe was Cuba’s most important geographical trading area, purchasing 15 percent of its exports and supplying 14 percent of its purchases abroad. The composition, by commodities, of Cuba’s exports in 1957-58 revealed the following value shares: sugar and related products, 79 percent; tobacco and products, 6 percent; mineral products, 6 percent; and other products, 9 percent. Cuba, in the latter 1950s, had already evolved important professional, technical and managerial middle groups and a substantial pool of skilled workers. Many of the country’s energetic and competent administrators were “schooled in large-scale operations through the great development of the sugar industry and other enterprises.”21 Spanish immigrants, particularly those who came to Cuba during the first quarter of the twentieth century, contributed disproportionately to the island’s stock of high-level manpower resources. About 80 percent of the Cuban land mass was under cultivation or used for grazing in the 1950s. The top soil is exceedingly fertile, deep, rich and well-watered, and the topography favorable to widespread use of farm machinery. An absence of climatic variation, however, limits the island to the cultivation of tropical and semi-tropical crops and to livestock raising. Domestic production supplied about 70 percent of Cuba’s food consumption. The island also contains important nickel mineral reserves and useful deposits of manganese, chrome, copper and limestone. It is favored with several large, well-protected natural harbors. The energy resources constitute the island’s major deficiency, for Cuba has no coal and very little oil had thus far been discovered. An extensive, well-integrated system of highways provided the basis for rapid postwar advance in the island’s motorized transport industry. The level of wages in Cuban manufacturing contributed significantly to the nation’s relatively high living standards. In 1957, wages averaged $6 for an eighthour day in manufacturing as a whole and ranged from over $4 for unskilled workers to $11 for skilled employees in Cuba’s sugar mills.29 Real wages in Cuba were higher than any country in the Western Hemisphere, excepting the United States and Canada. Given the nature of the international sugar market and Cuba’s substantial share as a world exporter,32 the nation’s policy makers perceived that the sugar sector no longer could provide the growing edge for the economy. After the record sugar crop in 1952, the Cuban government reinstituted restrictions on sugar production in the following year and, with the financial backing of the National Bank of Cuba, established a Stabilization Reserve. Thus, Cuba’s new development strategy aimed at reducing the economy’s dependence on its traditional export staple while stimulating industrial and agricultural diversification. Several measures were taken by the government to give substance to this diversification strategy.33 In 1952, Cuba negotiated a new trade agreement with the United States, superseding the one in force since 1934. This agreement, notes Antonio Jorge,34 was favorable to Cuba for it allowed the country moderate protection for its infant industries while simultaneously promoting diversification of exports to old and new markets. Unlike, e.g., Chile, Argentina, and Uruguay which—following the socalled ECLA (CEPAL) Doctrine—pursued strongly inward-looking trade strategies, Cuba in the late 1950s chose the more prudent middle course. An Industrial Promotion Law was enacted in 1953 that granted, among other things, tax incentives to new industries. Finally, credit was mobilized through official development banks set up during the early fifties. These included the Banco de Fomento Agrícola e Industrial de Cuba (1951); the Financiera Nacional de Cuba, organized in 1953 mainly to provide credits for public works; the Banco Cubano de Comercio Exterior, founded in 1954 to encourage nontraditional exports; and the Banco de Desarrollo Económico y Social, established in 1955 to administer the government’s development program.35 The public works projects included the construction of a good water system for Havana, a toll road and the tunnel under Havana Bay, and a new highway, the Vía Blanca. Cuban agricultural diversification gained momentum after 1952 and was reflected in gains in exports of farm and livestock products other than sugar. Rice production, advancing from 118,000 tons in 1951 to 261,000 tons in 1957, was a notable case of foreign exchange savings. The livestock industry, second only to sugar as a source of farm income, prospered during the fifties; Cuba’s cattle herd was built up rapidly from about 4 million head in 1952 to 5.8 million head in 1959.38 Starting from a small base, Cuba’s fish catch grew notably, from an annual average of 8,300 metric tons (MT) in 1948-52 to 22,600 MT in 1957. With 1953 as a base year, the index of manufacturing production (excluding sugar) rose from 133 percent in 1958 to 145 in 1959.43 This robust growth rate during the first year of the revolutionary regime suggests that many of these investment projects were still in their gestation phase when Batista fell from power. Examples include the Moa Bay plant which started operations in 1959 and the Cuban Telephone Co. which, in 1957, began a five-year development program. From 1953 to 1957, the Cuban economy experienced a sharp upward trend in real capital formation, both private and public, signifying growing autonomy of this key variable from the exigencies of international trade. As Table 1 indicates, real gross investment increased from 220 million pesos in 1953 (about 11 percent of Cuba’s GDP) to an average annual level exceeding 480 million pesos in 1956-57 (nearly 19 percent of GDP). The accelerated capitalization of the Cuban economy in sectors other than sugar production is also reflected in the changing composition of imports. The purchase abroad of fixed capital goods (Table 2) climbed steeply from less than $100 million (20 percent of total imports) in 1953 to an average of $207 million annually (27 percent of imports) during the two years 1957-58. Of the fixed capital goods purchased abroad in 1957- 58, 63 percent was invested in industry, 10 percent in diversified agriculture, 13 percent in motorized transport, and an equal share represented construction equipment.44 The share of consumer goods, mainly foodstuffs, in total imports fell from 46 percent to 1953-54 to 38 percent in 1957-58. These data and the preceding discussion indicate that Cuba, in the 1950s, made important gains in diminishing its dependency on the sugar sector. Following World War II, Cuba’s investment climate was one of the most favorable in Latin America. The Constitution of 1940 guaranteed the protection of property and established the judicial procedure for special cases involving expropriation. Property could be expropriated only for just cause involving a public utility or social interest and, then, only through prior indemnification of the owner in cash as determined by the courts. In sharp contrast to the more general postwar experience in Latin America, Cuba enjoyed financial stability through the period analyzed. The cost of living remained relatively stable, the peso continued at par with the U.S. dollar, and foreign exchange operations were free of control. The magnitude of the nation’s external public debt45 and the debt-service ratio were of minor importance throughout the 1947-1958 period. Profits, interest, and other factor payments could be freely remitted abroad and the risk of currency devaluation was negligible. From 1946 on, new U.S. investments in Cuba (see Table 3) assumed a highly diversified pattern and flowed into a spectrum of Cuba’s economic activities: infrastructure, manufacturing and commerce, petroleum refining, diversified agriculture, mining, and the tourist industry. The augmented production capabilities represented by U.S. subsidiaries and branches in Cuba were primarily directed to meet the requirements of the local market. Of the $403 million increment in U.S. direct investments in 1946- 59, petroleum refining accounted for $129 million, manufacturing for $75 million, public services for $60 million, and commerce for $32 million. New investments in diversified agriculture, mining, and hotels account for the remaining $107 million. These U.S. business investments in Cuba were decisive in the growth of electric power and telephone service, in the rapid advance of petroleum refining, and the mining of nickel, and helped support the diversification and growth of manufacturing. LeoGrande’s “capital drain” allegation is contradicted by his own data which shows that (except for the year 1951) the stock of U.S. direct investment in Cuba increased every year from 1943 to 1960.46 As with other “dependency theorists,” he fails to appreciate that profit remittances have their origin not in the capital account but in the income or production generated by multinational firms operating within the host country. A comprehensive survey of the impact of U.S. business investments on foreign countries was issued by the U.S. Department of Commerce in 1960. Among other things, the survey revealed the extent to which U.S. firms participated in the Cuba economy through production of their subsidiaries and branches for the island’s market and exports. The survey, however, does not include the export operations of the U.S. Government-operated Nicaro Nickel plant, tourism services provided by U.S.-owned hotels in Cuba, or the sales of more than 5,000 businesses owned by U.S. citizens residing in Cuba. As Table 4 shows, total sales of Cuban subsidiaries and branches of U.S. firms were about $730 million in 1957, of which $456 million (63 percent) were directed to the local market and $273 million (37 percent) to foreign markets. Of the $310 million agricultural sales, 80 percent were exported (principally sugar), and the balance reflected U.S. operations in cattle ranching, rice and tobacco growing. The preponderant share of the $150 million of manufactures sold by the U.S. affiliates (86 percent) was absorbed by the Cuban market, as were also the sales of petroleum products (98 percent). Exports of manufactured goods ($21 million) comprised mainly processed nickel. The services provided by U.S. affiliates—electric power, telecommunications, and public service railroads— were sold exclusively to Cuban customers ($118 million). The U.S. subsidiaries in Cuba employed an estimated 160,000 persons in 1957 and of 2,000 supervisory, professional, and technical personnel, less than 500 were sent from the United States.48 Foreign subsidiaries were cited by the World Bank Mission as “among those employers who pay the highest wages and who, for the most part, scrupulously observe Cuba’s labor legislation.”49 While employing only seven percent of Cuba’s labor force, the U.S. companies in 1957 accounted for one-third of the island’s merchandise export earnings and a little under one-fifth of total government revenues. The economic cost to Cuba of U.S. business holdings, measured by the rate of return (profit) on equity investment, appeared to be quite low when compared with U.S. direct investments in the rest of Latin America, in other parts of the world, and at home. Annual earnings for the 1950-1959 decade averaged $47 million, or 6.3 percent of equity investment, 7 percent of exports, and 2 percent of the GNP, not a price too high to have paid for foreign venture capital.50 Most profits did not leave the island, but were reinvested. 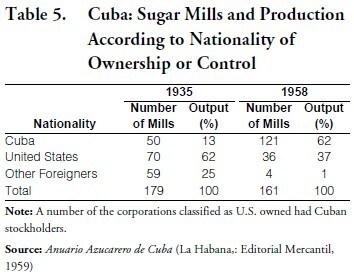 From the 1930s on, Cubans purchased a large number of sugar mills from U.S., Canadian, Spanish, Dutch, and French interests.53 As Table 5 shows, the U.S. share of Cuban sugar production declined from 62 percent in 1935 to 37 percent in 1958. Other foreign investors, whose sugar mills produced 25 percent of Cuba’s sugar in 1935, had sold virtually all of their holdings by 1958. The divestiture of sugar mills by foreign enterprises was accompanied by the transfer of cane land to Cuban ownership. Significantly, the small farmers grew only nine percent of Cuba’s cane in 1932, but by 1958 their share was well over 50 percent.54 In consequence, Cuban capital controlled three-fourths of the sugar mills; and these, in turn, accounted for 62 percent of the island’s sugar production in 1958. Local business interests, whose share of Cuba’s sugar production had been reduced to a mere 13 percent in 1935, thus regained their position of dominance after the Second World War. Transfer of these foreign assets into Cuban ownership proceeded through normal commercial channels and procedures—a manifestation of the progressive maturation of the island’s business community and postwar prosperity. In the early 1950s, Cuba’s policymakers adopted a new development strategy aimed at rapid economic diversification. Official measures in support of this strategy included the mobilization of new credit facilities, investment tax incentives, a moderate degree of protection from external competition of selected industries, and the construction of public infrastructure projects. This period saw a dramatic rise in the country’s investment coefficient, and the accelerated capitalization of the Cuban economy in activities other than sugar production also was reflected in the rapidly-expanding share of machinery and equipment in total imports. Industrial capacity advanced substantially in a number of branches, particularly electric power, glass containers, cement, oil refining, chemicals, nickel mining and processing, paper, and light copper and steel products. In addition to sugar mills and many traditional industries, Cuba had in 1958 an impressive complex of intermediate capital goods industries. American enterprise and technology played an important role in the development of intermediate capital goods production industries in the fifties. Contrary to the “decapitalization” allegation, U.S. direct investment in Cuba from 1946 to 1959 supported the country’s economic growth and diversification drive. The augmented production capabilities of U.S. subsidiaries operating in Cuba made important contributions to the country’s balance of payments position through new export earnings (tourism and nickel), and foreign exchange saved through import substitution (manufacturing, oil refining, commerce, the pastoral industry). The economic cost to Cuba of U.S. business holdings, measured by the rate of return on equity investment, appeared to be modest when compared with U.S. direct investments in the rest of Latin America, in other parts of the world, and at home. Through normal business channels, Cuban entrepreneurs gained ownership and control over economic activities formerly dominated by U.S. and other foreign investors. Most importantly, Cuban private capital owned three-fourths of the sugar mills and these in turn accounted for 62 percent of the island’s sugar production in 1958. The backwardness-stagnation thesis cannot be supported by the preponderance of empirical evidence. In comparison with other Latin American countries, Cuba on the eve of the revolution was not only well off, as measured by per capita income, but also quite advanced in terms of such social indicators as literacy and health.56 Significantly, the tropical island economy had the lowest mortality and infant mortality rates in Latin America in 1958. The newly-installed Castro regime inherited an economy undergoing robust investment in the nonsugar sector. Several industrial projects were still in their development phase and continued into 1959. Domestic and U.S. enterprises clearly were mobilizing their capital resources in preparation for the anticipated Caribbean tourism boom of the 1960s of which Cuba could have been the principal beneficiary. Problems of high unemployment and rural poverty were negative legacies bestowed by the old regime. On the other hand, Cuba in the late 1950s was not burdened by external debt dependency or an inefficient parastatal sector. Guided by the 1940 Constitution, a new democratic government enjoying widespread popular support could have addressed the negative legacies cited above. Cuba’s economic policy makers on the eve of the revolution were more in conformity with the “New Thinking” of the 1990s than the then fashionable (and now somewhat quaint) doctrines that influenced many of their Latin American counterparts. Four decades after the Marxist-Leninist revolution, Cuba shares with North Korea and Laos the dubious distinction of being classified the most “unfree-repressed” among the world’s 150 economies.58 It is ironic that in Latin America and the Caribbean, only Haiti shares with Cuba the “unfree-repressed” designation. 1. Dudley Seers, “Editor’s Preface,” in Cuba: The Economic and Social Revolution, edited by Dudley Seers (Chapel Hill: The University of North Carolina Press, 1964), p. V.
2. Benjamin Higgins, Economic Development (New York: W. W. Norton and Company, 1968), p. 806. 3. Susan Eva Eckstein, Back from the Future: Cuba Under Castro (Princeton: Princeton University Press, 1994), p. 18. 4. Michael P. Todaro, Economic Development (Reading, Massachusetts: Addison-Wesley Publishing Co., sixth edition, 1997), p. 97. 5. Norman Luxenburg, “A Look at Castro’s Statistics,” Encounter 67:3 (March 1984), p. 58. 6. Cuban Realities: May 1975, A report by Senator George S. McGovern, to the Committee on Foreign Relations, United States Senate (Washington: U.S. Government Printing Office, 1975), p. 6. 7. From the editor’s introduction to Robert F. Smith, “The United States and Cuba,” in Foreign Investment in Latin America, edited by Marvin Bernstein (New York: Alfred A. Knopf, 1966), p. 145. 8. William M. LeoGrande, “Cuban Dependency: A Comparison of Pre-Revolutionary and Post-Revolutionary International Economic Relations,” Cuban Studies/Estudios Cubanos 9:2 (July 1979) p. 22. 9. Maurice Zeitlin and Robert Scheer, Cuba: Tragedy in our Hemisphere (New York: Grove Press, 1963), p. 29. 10. Frank Deaver, “Cuba’s Outlook: More of Same,” in the Ideas and Issues section of The Tuscaloosa News (November 5, 1995), p. 5E. Until his recent retirement, Deaver was professor of journalism at the University of Alabama. In 1990, he directed an international journalism project for the Alabama Press Association and in that capacity led a delegation of reporters and editors on a reporting mission to Cuba. 11. James O’Connor, “Cuba: Its Political Economy,” in Cuba in Revolution, edited by Rolando E. Bonachea and Nelson P. Valdés (Garden City, New York: Doubleday and Co., Inc., 1972), p. 80. 12. Seers, “The Economic and Social Background,” in Cuba: The Economic and Social Revolution, p. 19. 13. This section and the next draw liberally from Eric N. Baklanoff, Expropriation of U.S. Investments in Cuba, Mexico, and Chile (New York: Praeger Publishers, 1975), chapter 2, and Baklanoff, “The Structure of Cuba’s Dependency Preceding the Revolution,” SECOLAS Annals, vol. 11 (March 1980). 14. See, for example, Gerald M. Meier, International Trade and Development (New York and Evanston: Harper and Row, 1963), pp. 5- 6. 15. See Consejo Nacional de Economía, El empleo, el subempleo y el desempleo en Cuba (La Habana, January 1959), Tables 2 and 6. 16. James O’Connor, The Origins of Socialism in Cuba (Ithaca, N.Y.: Cornell University Press, 1970), p. 182. 17. José R. Alvarez Díaz, et al., Cuba: Agriculture and Planning (Coral Gables: University of Miami, Cuban Economic Research Project, 1965), pp. 121-2. 18. Cuban Economic Research Project, A Study on Cuba (Coral Gables: University of Miami Press, 1965), p. 555, Table 409. I have subtracted from the total given in the table the sum of $645.4 million which corresponds to “transportation and communication,” activities normally excluded from the industrial or secondary sector. 20. International Bank for Reconstruction and Development (World Bank), Report on Cuba (Baltimore: Johns Hopkins Press, 1951), p. 12. 21. Henry C. Wallich, Monetary Problems of an Export Economy: The Cuban Experience, 1914-1947 (Cambridge: Harvard University Press, 1950), pp. 5-6. 22. International Bank for Reconstruction and Development, Report on Cuba, p. 72. 23. United Nations, Yearbook of National Accounts Statistics (New York: United Nations, 1962). 24. Paul Hoffman, former administrator of the Marshall Plan, classified 100 underdeveloped countries of the world into four categories by average per capita income. Fifty-two fell in the under $100 a year category, 23 in the $100-199 category, 16 in the $200-299 category and 9 in the $300-699 category. Cuba was one of the top nine. P.G. Hoffman, One Hundred Countries, One and One Quarter Billion People (Washington: Committee for International Economic Growth, 1960). 25. See United Nations, Statistical Yearbook (New York: United Nations, 1960) and Center for Latin American Studies, Statistical Abstract of Latin America (Los Angeles: University of California at Los Angeles, 1961). 26. Norman Luxenburg, “A Look at Castro’s Statistics,” p. 59. 27. Carmelo Mesa-Lago, “Economic Policies and Growth,” in Revolutionary Change in Cuba, edited by Carmelo Mesa-Lago (University of Pittsburgh Press, 1971), p. 295. 28. Ernest Schwarz, “Some Observations on Labor Organizations in the Caribbean” in The Caribbean: Its Economy, edited by A. Curtis Wilgus (Gainesville: University of Florida Press, 1954), p. 167. 29. Alice Shurcliff, Labor in Cuba (Washington: U.S. Bureau of Labor Statistics, 1958), p. 21 cited in O’Connor, The Origin of Socialism in Cuba, pp. 185-6. 30. Mesa-Lago, “Economic Policies and Growth,” pp. 279-80. 31. Mesa-Lago, “Economic Policies and Growth,” pp. 280. 32. The island produced approximately 15 percent of the global production and supplied one-third of the sugar sold in the international market. Further, sugar is characterized by very low income elasticity, i.e., a rise in world income has little effect on the demand for the commodity. 33. See Banco Nacional de Cuba, La Economia Cubana en 1956-57 (La Habana, 1958). 34. Antonio Jorge, “Cuba’s Economic Model(s) and Economic Rationality,” in The Cuban Economy: Dependency and Development, edited by Antonio Jorge and Jaime Suchlicki (Coral Gables: University of Miami North-South Center for the Research Institute for Cuban Studies, 1989). 35. United Nations, Economic Commission for Latin America, Economic Survey of Latin America, 1957 (New York: United Nations, 1959), p. 182. 36. Cuban Economic Research Project, A Study on Cuba, derived from Table 428, p. 569. 37. Cole Blasier, “The Elimination of United States Influence,” in Revolutionary Change in Cuba, p. 62. 38. U.S. Department of Agriculture, A Survey of Agriculture in Cuba (Washington, 1958), p. 22, Table 6. 39. United Nations, Economic Commission for Latin America, Economic Survey of Latin America, 1957 (New York: United Nations, 1959), pp. 190-93. 40. The New York Times (August 21, 1960), sec. 3F. 41. Banco Nacional de Cuba, Programa de Desarrollo Económico, Informe No. 2 (La Habana, 1957), p. 19. 42. United Nations, Economic Commission for Latin America, Economic Survey of Latin America, 1957, p. 192. 43. Jorge Pérez-López, An Index of Cuban Industrial Output, 1930-1958, Ph.D. dissertation, State University of New York at Albany, 1974. Cited in Claes Brundenius, Revolutionary Cuba: The Challenge of Economic Growth and Equity (Boulder: Westview Press, 1984), pp. 34-35, Table 2.2. 44. Banco Nacional de Cuba, Memoria 1957-58, p. 192, Table 6.16. 45. Cuba’s total long-term foreign debt was only $48.2 million at the end of 1958. Ministerio de Hacienda data, cited in José M. Illán, Cuba (Miami: Editorial AIP, 1964), p. 75, Table 31. 47. “U.S. Business Investments in the Cuban Economy,” Release of November 14, 1960 (OBE 60-83). 48. U.S. Department of Commerce, United States Business Investments in Foreign Countries (Washington, 1960), p. 122, Table 34. 50. Derived from Survey of Current Business, 1956-1961, August and September issues. 51. See Eric N. Baklanoff, Expropriation of U.S. Investments in Cuba, Mexico, and Chile (New York: Praeger Publishers, Inc., 1975), chapters 2 and 6, and Leland L. Johnson, “U.S. Business Interests in Cuba and the Rise of Castro,” World Politics 18:2 (April 1965). 52. United Nations, Department of Economic and Social Affairs, Foreign Capital in Latin America (New York: United Nations, 1955), p. 80. 53. From 1934-51, Cubans purchased 32 mills from U.S. interests for about $35 million; nine from Canadians for $7,750,000 and two each from Spanish, Dutch, and French interests for a total of about $5 million. During the period of 1952-55, inclusive, five mills came under Cuban control. U.S. Department of Commerce, Investment in Cuba (Washington: Government Printing Office, 1956), p. 37, footnote 16. 54. O’Connor, The Origins of Socialism, pp. 27-28. 55. Before Cuban independence, and despite tariff preferences favoring Spain, the value of U.S.-Cuban trade by 1881 was over six times that of the island’s commerce with Spain. See Jules Robert Benjamin, The United States and Cuba: Hegemony and Dependent Development, 1880-1934 (Pittsburgh: University of Pittsburgh Press, 1977), p. 5. 56. On this point see also Robert A. Packenham, “Capitalist Dependency and Socialist Dependency: The Case of Cuba,” Journal of Interamerican Studies and World Affairs 28:1 (Spring 1986), pp. 59-89. 57. Luxenburg, “A Look at Castro’s Statistics,” p. 62. 58. Kim R. Holmes, Bryan T. Johnson and Lena Melanie Kirkpatrick, editors, 1997 Index of Economic Freedom (Washington and New York: The Heritage Foundation and Dow Jones and Co., 1997).